Well now it’s September and time to look back on a busy summer! There are lots of new photos in the students’ gallery showing the great work that’s been done in the workshop. One of the things I love about our courses is the sheer diversity of the work, each piece really is unique and it’s one of Pete’s strengths as a tutor to help people translate their ideas into stone. Some people have a really clear idea of what they want to make, others choose their subject with Pete’s help when they arrive. 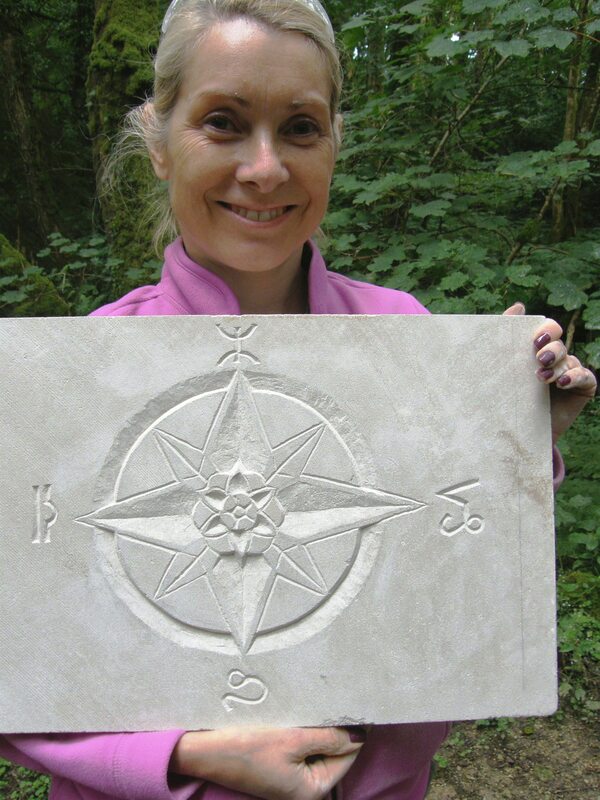 Sarah was one student who had thought carefully about her carving and made a very touching relief carving representing her family; the four points of the compass are the four children, symbolised by their star signs and Sarah and her husband Brian are represented by roses at the centre (the flower symbol for their birth month). Sarah has a strong interest in history and archaeology and really enjoyed getting hands-on experience with stone and getting a feel for the traditional skills.